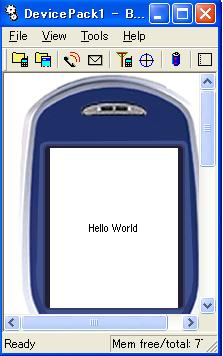 This tutorial will guide you through programming HelloWorld application for BREW in C++. After finishing this step, you will understand how SophiaFramework UNIVERSE works for your BREW application. * Source code is included in the SophiaFramework UNIVERSE free trial. Theme: Display "HelloWorld" on the display. Goal: Feel SophiaFramework UNIVERSE ! If fatal errors such as "include error" occur when compiling applications developed with SophiaFramework UNIVERSE, please re-install SophiaFramework UNIVERSE. These fatal errors occur when the inlude files or library paths are not correctly registered for Visual Studio. Select [Tools (menu)]->[Options (menu)]->[Directories (tab)] and in the drop down menu titled [Show directories for:] select the [Include files] item. If the path is not set up, it can be set manually by clicking on the bottom blank area of the list box. Select [Tools (menu)]->[Options (menu)]->[Directories (tab)] and in the drop down menu titled [Show directories for:] select the [Library files] item.